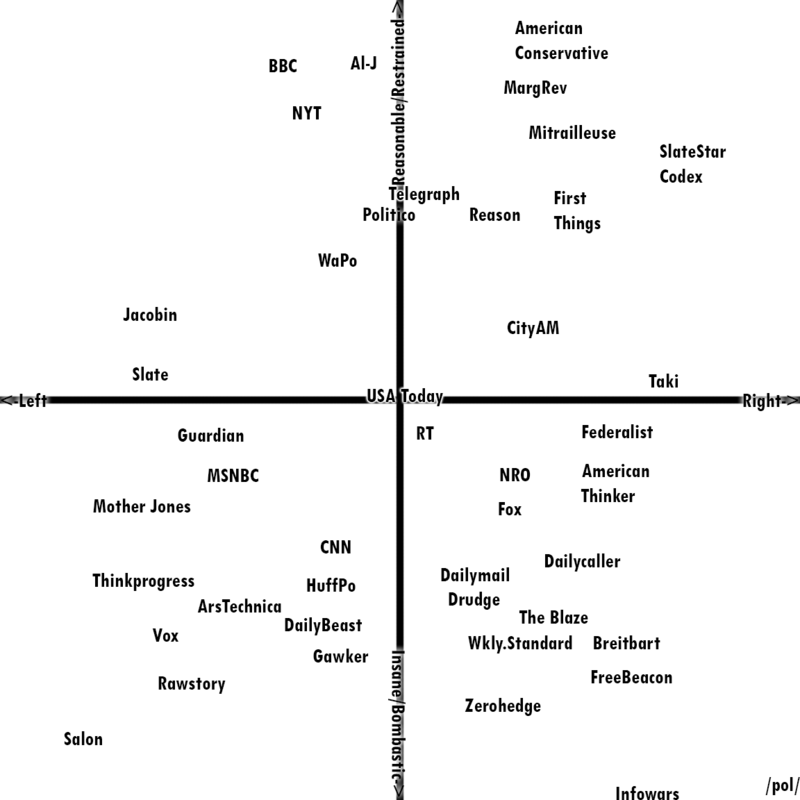 The Y axis is has publications that are more reasonable/restrained up top and bombastic/insane lower. 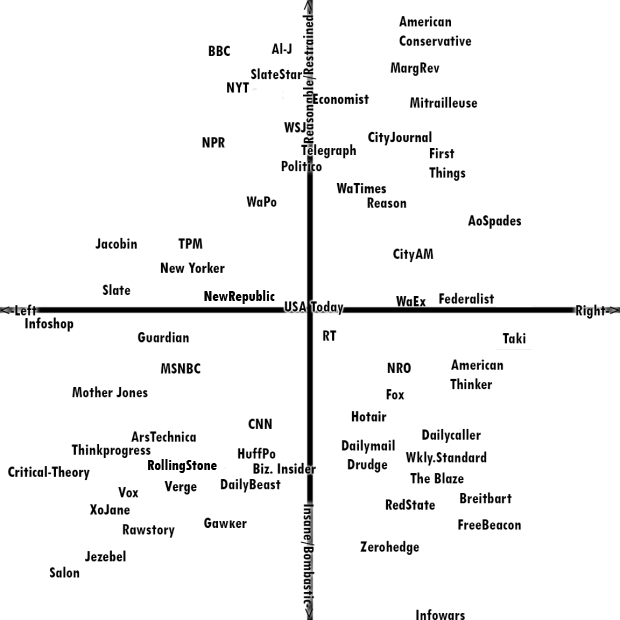 The X axis is left-right. I added The Daily Signal, New York Post, Spiked, IJ Review, Mic, Upworthy, New York Magazine, Crisis Magazine,The New Inquiry, The New Criterion, The Atlantic, and blogs, The Future Primaeval, Social Matter and Freddie DeBoer. I adjusted the position of others. Breitbart gained some reasonability points for being one of the few media outlets to cover gamergate in an honest fashion. The New Republic got pushed down due to its attempted transformation to a Salon-like click model and voice, causing an exodus of respectable staff. Am I missing anything? Anything out of place? Leave a comment or tweet at @robert_mariani. Even blogs will be considered. Update: An updated version of the chart can be found here. 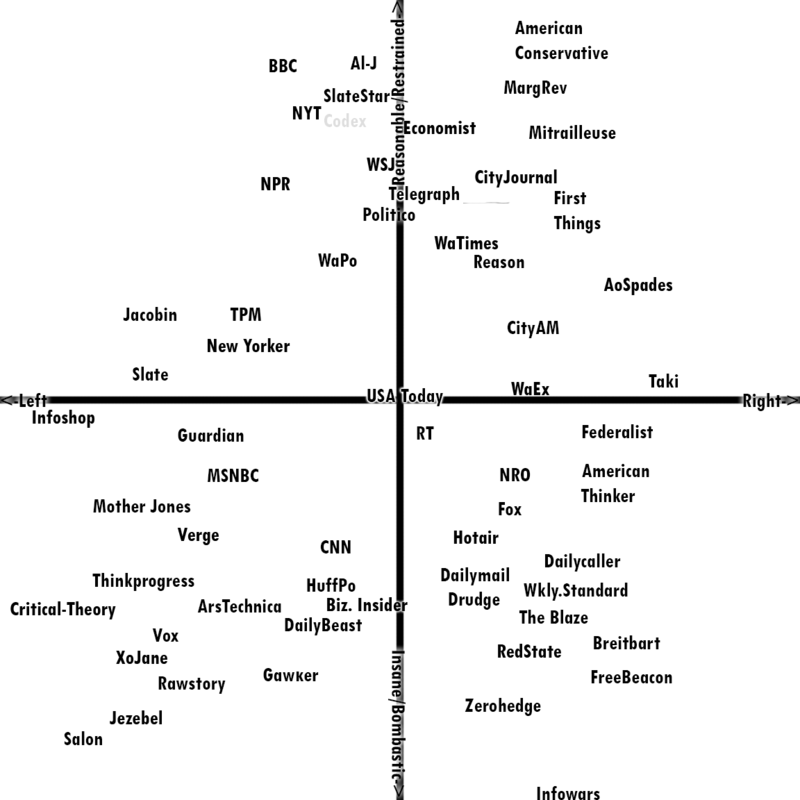 This is an effort to chart where media outfits fall not only in terms of left-right slant, but their how restrained or bombastic they are. What they cover: Covering trivial/overcovered matters makes you negative and covering important things pushes you towards positive. Clickbait and listacles = negative. Level-headedness of tone = positive. 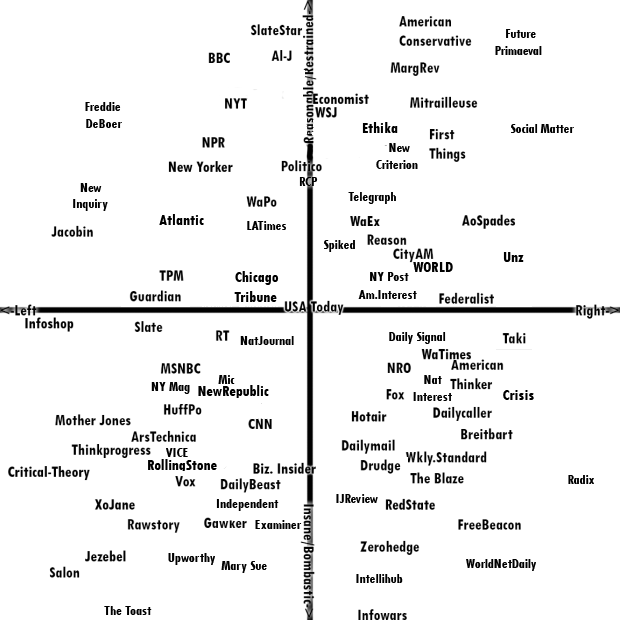 Factors on the “Left – Right” spectrum include studies of trust and bias, as well as self-description and consensus among those who suggest placement on the chart to me. You can pinpoint the “left-rightness” of an outfit by looking at where the first letter is, not the middle or last letter. If you want something added or think something is out of place, leave a comment or send a tweet to @robert_mariani.